(e)National Meets and National Championships. These are defined as meets which are confined to swimmers from within the host club. Swimmers must be 8 years of age in the year of the competition to compete in these. Times achieved at these meets can be used for entry to Inter-Club meets and Club Open meets. Swimmers must be at least 9 years of age to compete in these meets. 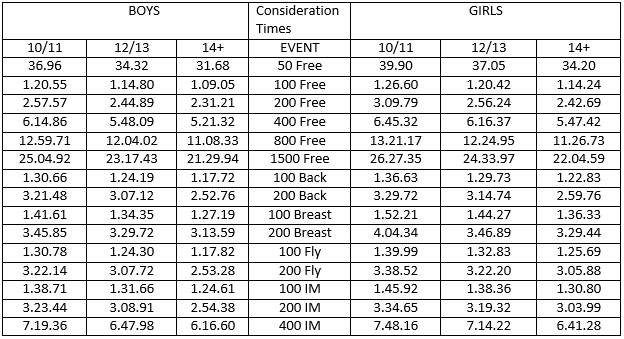 Times achieved at these meets may be used for entry into Regional Development and Regional Qualifying meets, specific Club Open meets may be used for Regional LC Championships. Development Meets: Swimmers must be at least 10 years of age to compete at these meets. In Development meets there will be no qualifying times but cut off times will be in force i.e. if a swimmer is faster than a cut off time they will not be eligible to compete in that event. All development meets will include 100m Ind. Medley. Times achieved at Development meets may be used for entry to Regional Qualification Meets. Qualification Meets: Swimmers must be at least 10 years of age to compete at these meets. 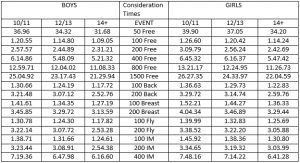 Swimmers must have achieved the published consideration standard to be considered for entry (see time standards above). Times achieved at these or equivalent meets may be used for entry to Regional Championships and if achieved in a Long Course pool in the Long Course season (1 st January – closing date) may be used for entry to the Irish Summer LC Nationals.